Always make sure that you buy is fresh fish. 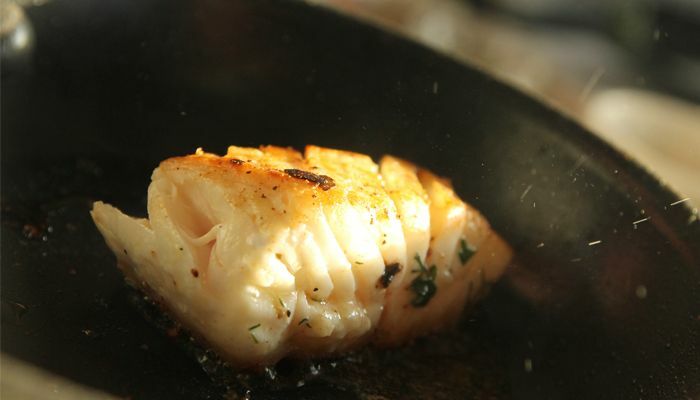 This will help you get a great sear on the fish. You also want to make sure your fish is as dry as possible before cooking. Use a paper towel to dry. If you have to buy frozen white fish then it is important to let it naturally thaw in your refrigerator 12 hours before cooking. I like to season my fish on both sides 5 minutes before cooking. This technique helps a crust form when cooking. Below is the best technique to cooking great fish with a nice sear. Turn your oven on to 350° to start this technique. Heat a medium to large fry pan to medium high heat. Add 1.5 tablespoons of canola or vegetable oil. Place your fish in the pan with the pretty side facing down. Put your fish in the oven and finish cooking for 3-7 minutes depending on thickness. Flip the fish over onto your plate when you are ready to serve. You will see a golden brown crust!